MAINTENANCE: SUCH A DREARY WORD. IT MAKES US THINK OF the handyman, the super, the janitor—the guy you call to clean up the mess or fix what’s broken. You don’t know how to do it so you call someone else. Plus it just seems like it takes way too long. Maybe you don’t think of yourself as very mechanically inclined. Besides, if you’re already crunched for ride time, how are you supposed to care for your bike, too? Basic maintenance, in actuality, can be really quick, fun, and easy, as well as help you get to know your bike much better so you have more control over how it rides. By taking care of your bike, it will become less of a mystery machine beneath you and more of a trusty tool you wield to get you where you want to go. Not to mention that maintaining your bike is a huge money saver. By taking care of your ride, you won’t need as many expensive parts or repairs in the future. At the very least, riders need to know how to clean the frame, air up the tires, clean the rims, and clean and oil the chain. These are the very basics of what you should be doing to care for your bike. By mastering them, you’ll be empowered to take on any ride, anytime. 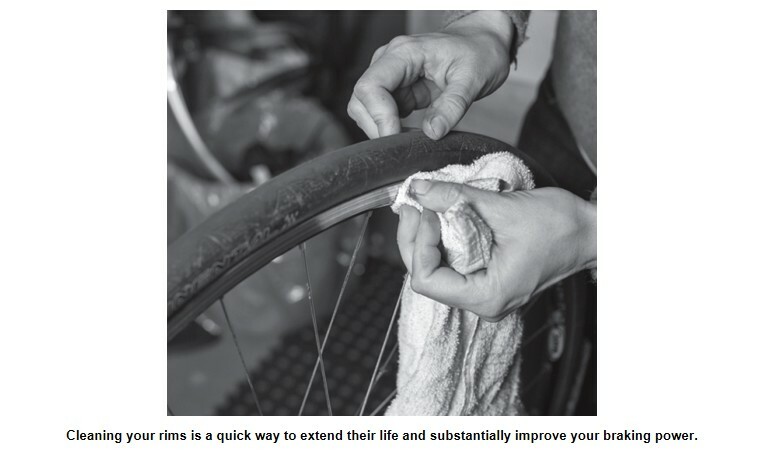 We’ll also give you some big tips on changing flats and how to make the most of your local bike shop so when you do head in for repairs, it’s with a smile. Getting your tires aired up properly is the single most important thing you can do to make sure you have a good ride. It’s a little like the Goldilocks fable: too much and you’ll lose traction; too little can cause flats; somewhere in the middle is always best. To start, you’ll need to have a good floor pump with an accurate gauge, which you can buy at your local bike shop, so you know how much air you’re putting in. In the United States, inflation is measured in psi (pounds per square inch) units. The amount your tire needs will usually be printed as a range on the side of the tire—sometimes into the rubber, where it’s a little hard to find. It will often read something like 80 psi min.–110 psi max. (5.5 bar–7.6 bar). This tells you the minimum and maximum recommended pressure (the “bar” measurement is a European standard). As a general rule, the max is for a person who weighs 185 pounds or more. If you weigh less, the tire manufacturer will have different recommended inflations on its website. For example, if a rider weighs 140 pounds on one brand of tire, she would inflate her tires to 95 psi in the back and 85 psi in the front. Because more of your weight is on the saddle and centered over the back wheel, you should inflate the front a little less. Since the front wheel controls your steering, using a slightly lower pressure than your rear (by about 10 psi) gives improved traction for better control on turns and descents. The valve stem is where you put the air into the tube. There are two kinds of stems: One is called Presta, the other Schrader. Most road bikes come with Presta valves, which are skinny and metal with a little nubbin at the top that needs to be unscrewed to let air in or out. Practice depressing this to let air out. You’ll sometimes need to do this to prime the valve to let air in, too. Always have the valve stem facing down (between the 10 o’clock and 2 o’clock position) on your wheel to clamp your hose on. Having it there will make it easier to control and give you better positioning for removal of the pump head after inflation. When it’s full to the recommended pressure, unclamp the hose and, with both thumbs on the face of the head, push it gently toward the hub at the center of the wheel. You should hear a small gasp of air leave the hose after it’s depressurized. If you wiggle the hose or pull it to the side to remove it, you’re more than likely to release air from the tube or break the valve stem off. Because the tube inside the tire is just a big, high-pressure balloon, it usually loses air over a few days to a week. Check your tires every 2 to 3 days, or if you’re riding less often, pump them every time you leave for a ride. If you’re regularly oiling the chain, you shouldn’t have to clean it every time you oil it. Save cleaning for about every 500-plus miles when you can also clean your chainrings (gears in front) and cassette (gears in back). The important thing to remember is that your chain needs lubrication, so overcleaning it can actually wear it out. Start by flipping your bike upside-down and spraying degreaser (409, a citrus degreaser) or a bike-specific chain cleaner (like the degreaser from WD-40 Bike) on the links and scrubbing with an old toothbrush. After you’ve lifted most of the dirt, wipe it clean with a rag—unless it’s the WD-40 Bike brand degreaser, which you rinse with water. If you’ve used a spray degreaser directly on the chain, you need to wait 24 hours before applying oil to give time for the degreaser to evaporate completely from between the links. There are also gadgets on the market to clean your chain, but the toothbrush-and-degreaser method works just as well. If your chain is only lightly dirty or you want to clean it more regularly, you can spray the degreaser on a rag and wipe the chain clean with it. In either case, there’s never a need to remove the chain or the wheel. Both will just make the job harder, and breaking the chain apart will only decrease its life. If you want to clean the cassette and chainrings as well, this is a great time. The chainrings you can scrub with a brush and degreaser on the bike. To get to the cassette, take your rear wheel off your bike and lay it down with the gear side facing up. Spray degreaser on the teeth of the cogs and scrub with a firm brush. Get between the gears with a piece of cardboard or specially made gear-cleaning brush. Floss a rag between each gear and roll it back and forth to clean it free of any debris or black grime. A little science lesson: Most rims are commonly made of aluminum. Like steel oxidizing into rust, aluminum also breaks down when it contacts air, but it breaks down into a strange black dust that is kind of like the graphite from your pencil. Every time it’s exposed to air, your rim oxidizes, but that same black oxidization dust protects the aluminum underneath from oxidizing more. Unfortunately, every time you use your brakes, you’re wiping the old layer off so a new one forms. When it rains, aluminum oxidizes even more and the black grime gets slimy and slippery—which is one of the reasons it’s so hard to stop on wet surfaces. If you live anywhere humid or rainy, maintaining your rims is extra important. In the desert or dry areas, it’s not as critical, but still nice to maintain. The easiest way to maintain them regularly is to wipe them down with a dry rag every time you oil the chain (using a different, clean rag, of course), every hundred miles or so. You can also use rubbing alcohol, but avoid using a bottle of spray cleaner or degreaser to get rid of the grunge—it tends to smear around instead of coming off on the rag and leaves a soapy film that can make your brakes squeal. 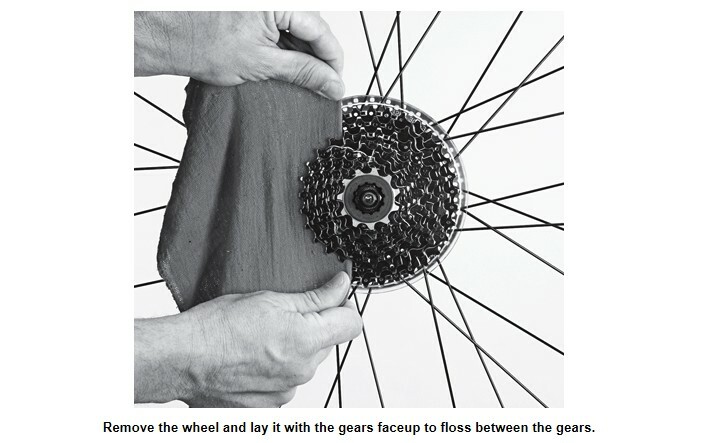 To clean, have your bike upside down and spin the wheel while holding the rag against the braking surface of the rim. It shouldn’t take more than 2 minutes to get both sides of the front and rear wheels. Another option is to clean them while you’re cleaning the frame (see the next section). Although a spray cleaner makes a smeary mess, a bucket of soapy dishwater and a firm brush use enough fluid to lift the oxidized dust and let it run off the rim. This method cleans a little deeper than just wiping with a dry rag or rubbing alcohol—just make sure to rinse after soaping up. The bottom line is, if you don’t clean them on a regular basis, the grit will build up—making it much harder to stop, which will make you squeeze the brake harder, which creates even more of the oxidization grit, which will in turn wear the rim out faster. Since the wheels are one of the most expensive parts of your bike, it’s a time (not to mention a life) saver that can also help your pocket book. Like with your body, everything feels better and the world is a better place after a nice shower. In the case of your bike, it doesn’t have to be warm, but a shower is the best because it’s the fastest, easiest, and most thorough way to a clean bike. By getting rid of all the road grit, sugary drink drips, and salty sweat, you’ll end up with a nicer ride. Start by rinsing your upright bike gently with the hose or shower to loosen the grime. The keyword is gentle. Don’t use a strong spray or worse, or you’ll risk ruining your bike’s bearings by forcing water and dirt where only grease belongs; if you flip your bike over, all the water will run inside the frame. A good rule of thumb for washing your bike is to think of the water pressure as if it’s coming out of a watering can. Use the soapy sponge to clean your frame (the brush might scratch the paint or clear coat). The brush is great for scrubbing off all the black oxidization grime from the rims and getting into harder-to-reach nooks and crannies—like in your brake arms or derailleurs. Rinse the soap off after cleaning. If you’ve used the WD-40 Bike brand degreaser mentioned earlier, this is a great time to rinse that off, too. If you didn’t, wipe any excess water off the chain so it doesn’t rust. When you’re finished, pick up your bike a few inches off the ground and drop it a few times to help shake off the water. You can also use a bottle of spray cleaner or degreaser (409, Simple Green, Citrasolve, or other citrus degreasers work great) and some rags following similar directions, but the shower method works better and cuts your cleaning time by half. For a nice finishing touch, you can use furniture polish or some specially made bike products that protect the paint on your frame. It not only looks sweet, but it also keeps dirt from accumulating as quickly between cleanings. There are a lot of moving parts on your bike, but nothing gets put through the ringer like your chain. You’re entirely dependent on it to make your bike move forward, so it’s working constantly with every push of the pedals. If you take a close look at the chain, you’ll notice it has plates on the sides, and little rollers in the middle with pins through them holding it all together. When you lubricate your chain, you’re trying to get oil into all the little parts inside of it where metal meets metal to help it move effortlessly. >You don’t oil your chain enough (or at all). >You put way too much oil on. Both of these can cause your chain to wear out before its time—though not oiling your chain is the worst thing you can do. Your chain needs lubrication inside it to flex over all those gears smoothly. 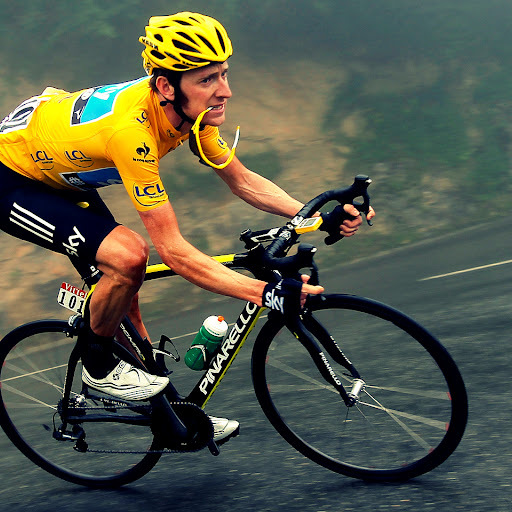 If it’s dry, it has to work harder to do its job—which creates resistance when you push the pedals. You’ll know when this happens, as it will start making a lot of noise that starts to sound like a gentle swishing with each pedal stroke and progresses to a loud, squeaky, creak. One easy trick to getting faster with less effort: Oil your chain every hundred miles—or more often if you get caught (or ride regularly) in the rain. Too much oil on the chain is like grease on your stove—it collects dirt and makes a mess that’s difficult to clean up. Unfortunately, not only will it spatter a black, greasy film all over your frame and wheels (which, as you might guess, doesn’t help with stopping), the goopy, greasy dirt will work into those little spaces you’re trying to lubricate, wearing down your chain. Luckily, oiling it is one of the simplest, easiest tasks to do—even for a complete novice. So every hundred miles, here’s what to do to keep your chain quiet and give it a nice, long life. 1. Flip your bike over. Your rear wheel will have to be off the ground to run the chain both backward and forward. 2. Where the chain is exposed and not wrapped around any gears, hold the straw or tip of the oil bottle against the chain and turn the pedals five or six times until you’ve gone around the chain at least twice. Pedal smoothly and at a moderate pace so the oil skims over the top of the chain and spreads out. Don’t put a drop of lube on every link—that’s a surefire way to over-oil it. Also avoid putting oil on the gears. 3. Wipe the excess lubricant off. While holding a pedal to keep the chain from moving, wrap a rag around an exposed part of your chain and wipe back and forth on the top and bottom until the chain looks clean and free of oil on the outside surface. Work in small sections until you’ve gone around the chain completely. Don’t just run the chain through a rag while pedaling; instead, really scrub the excess oil (and dirt) off the outside of the chain. 4. 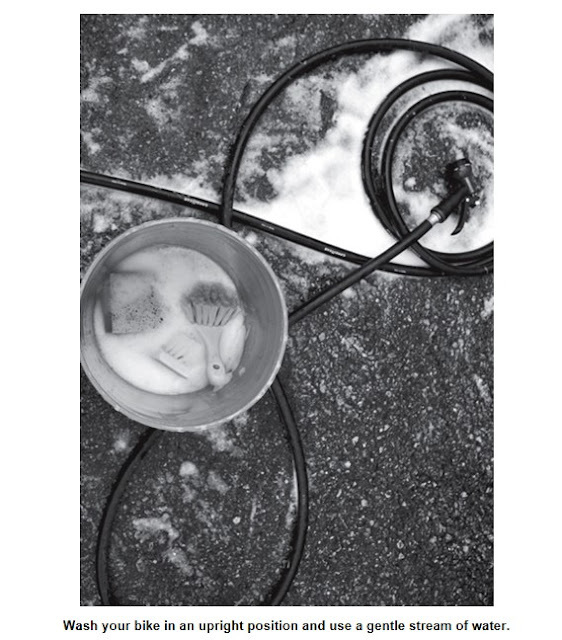 Work your way around until the entire chain looks clean and there’s little to no visible oil or dirt on the outside. This is the most important part of oiling the chain. You need to spend two to three times longer to wipe it down than it took you to put the oil on. This method uses the excess lubricant you’ve applied to help clean any accumulated dirt or old oil off your chain—like a two-in-one shampoo/conditioner combo!